The chemical composition of any oil product is a mix of different elements. Here you have hydrocarbons, hydrogen, oxygen with nitrogen, and sulfur. 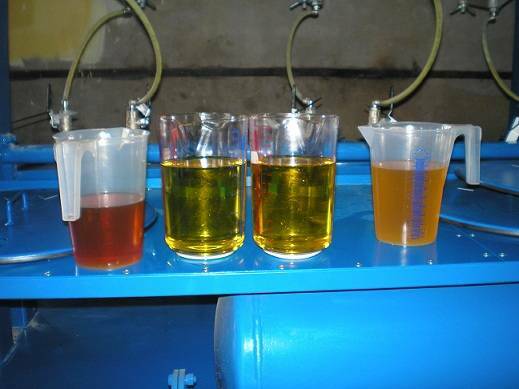 It is clear that the presence of these and other elements is defined by the type of feedstock (petroleum oil), and the method of oil process. To produce diesel fuel, good for fuel economy, it is very important to ensure exactly that percentage ratio of components that gives the best possible operating qualities. The main problem is that in most cases there are not entirely useful or entirely harmful elements. Any substance, depending on volume, can alter its chemical effect on diesel fraction. Let’s take sulfur, for example. Everything seems very clear here. During the combustion of diesel fuel, sulphur promotes sludge deposits, leading to malfunction of engine and fuel system. Environmentalists add that burning sulphur diesel fuel emits noxious gases into the atmosphere. This state of affairs encouraged European community to solve this problem at the legislative level, strictly regulating sulfur content in their fuels. You probably heard about the brand of fuel “Euro” . There is, however, another side of the coin. Complete removal of sulfur (for all its downsides) is also undesirable. The absence of this chemical worsens lubricating properties of diesel fuels which in some cases may be crucial. Therefore it is very important to keep a reasonable balance of the percentage of sulphur for practical use. Cleaning diesel fuel from sulfur – is a difficult task. Depending on the type of oil it can contain many sulfur compounds when converted to elemental sulfur they range from 0.5% to 5%. Oil processing destroys volatile compounds, but they almost immediately react with other chemicals forming new substances. These, for example, may include hydrogen sulfide, which is removed together with other gaseous products by an alkaline wash of hydrocarbon fractions. Interestingly, under certain conditions (temperature, pressure, the presence of a catalyst, etc.) new compounds can again decompose to elemental sulfur. Petroleum refining industry use so-called hydro-treatment to reduce sulfur content. It breaks down all sulfur compounds forming hydrogen sulfide, the removal technology of which, as of today, is sufficiently developed. There is also an alternative view, offering to remove absolutely all sulfur compounds from fuel, regardless of their chemical composition. Here, too, there are implications. Sulfur-containing compounds in their chemical nature are very diverse. Some contribute to corrosion, reduce the stability of fuel to oxidation and intensify the appearance of resins and various sediments. Other sulfur compounds on the contrary – are non corrosive and have an antioxidative effect. Summarizing the results, we note that new chemical compounds based on sulfur, are still not fully understood, which complicates desulfurization of diesel fuel. Therefore, in production are often used oils with limited sulfur content or deeply cleaned oils. Sulfur compounds are destroyed by catalytic cracking, hydrogenation, hydrotreating and other methods. The approaches mentioned above are used mainly in large refineries. So what should small farms or machine and tractor stations do? They too have a problem of desulfurization of diesel fuel. Every owner wants his motor vehicles work effectively as long as possible, and it is only possible when using high-quality diesel fuel. Buying bulky equipment that is used in refineries is very expensive and not economical. Delivering contaminated fuel to the factory for cleaning also does not seem to be an optimal way. Treatment facilities are not always located in close proximity to the farms. In this case, shipping costs exceed the potential benefits. And the small volume of fuels used by autonomous farms is not always suitable for the refinery. It is unprofitable to run a huge installation, which consumes a lot of power for processing a small batch of oil. A vicious circle? Not really. GlobeCore developed and manufactures UVR installations. They not only reduce sulfur content, but also clarify and restore diesel and heating oil, gas condensate, transformers, industrial, turbine and other oils. Model UVR-450/6 is ideal for fuel economy and purification at small farms, motor companies as well as other economic entities with daily fuel consumption of up to 4000 gallons or oil up to 2000 gallons. The main advantages of GlobeCore equipment are its universality, portability, minimal power consumption, as well as the ability to work in automatic and semi-automatic modes, which helps to minimize human factor in the process.